About six months after it was published in 2007 I was sitting on the Central Line tube opposite an elderly black gentleman who was reading The Restless Generation, Pete Frame’s definitive account of British rock’n’roll in the pre-Beatles era. Having just read the book myself I had to stop myself from asking him if he was enjoying it and why he was reading it, but the image of this old black dude engrossed in Pete’s book stayed in my mind for a long while afterwards and I remember e-mailing Pete to tell him about it, knowing how delighted he would be that it had reached out to someone like this. The pre-Beatles era of British rock has always fascinated me, just as it has fascinated Pete. That’s why I eulogise about ‘Shaking All Over’ by Johnny Kidd & The Pirates elsewhere on Just Backdated and why I was so delighted a while back to meet and talk with the drummer Clem Cattini from The Tornados who played on ‘Telstar’. 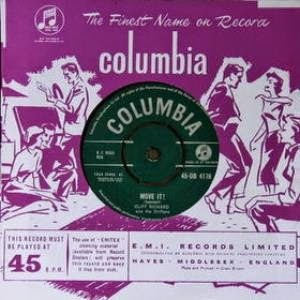 I’m intrigued by Joe Meek, the British Phil Spector, and ‘Move It’ by Cliff was one of the first 45s I owned. When Pete was opening his Rock Family Trees exhibition at the Barbican on Wednesday evening he mentioned in his talk the extent of the UK music establishment’s extreme prejudice against American rock’n’roll and how aficionados such as himself had their work cut out to find it. The BBC, the record companies, the music publishers and the music press – most notably Melody Maker (oh, the shame!) – conspired unsuccessfully to bury it. Of course it was a bit like King Canute trying to stop the waves but all these hoary old men tried their damndest to prevent what they saw as a threat to the morals of Britain’s youth and, let it be said, their own livelihoods. This is a central theme of The Restless Generation and Pete spares no bones when it comes to naming the guilty parties and lacerating them for their bigotry and short-sightedness. Equally persistent in their opposition to rock’n’roll, the BBC’s Dance Music Policy Committee auditioned records to deem them suitable or otherwise for broadcast, invariably giving the thumbs down to Elvis, Jerry Lee and the like. Needless to say they were in favour of promoting British music, and when this was communicated to the Controller of Sound Entertainment he responded by writing a memo of his own which he sent to BBC staff: “We should look at existing programmes with an eye to the ultimate possibility of removing the American element and replacing it with something un-American if we can find it, which does the same job.” In other words the BBC had declared war on the future. This was the aspect of The Restless Generation that made me sit up and scream, but there’s a whole lot more to the book. Pete brings to it the same relentless research skills he brings to his Rock Family Trees, telling the tale of British rock music from its birth as an annex of jazz through the skiffle era to the largely plastic pop idols seen on TV shows like 6.5 Special and Oh Boy. He also tells the story of ‘Move It’, the first great UK rock’n’roll record and the first and best (and, arguably, only decent) record Cliff Richard ever made, which has been recognised as such by countless clued-up rock musicians ever since. It was written by Ian Samwell, and in a moving epilogue to his book Pete recounts how when word got around that Samwell needed a new heart in 1991 and was languishing in an LA hospital wanting for funds to pay exorbitant US medical expenses, cheques arrived from all manner of rock’n’roll millionaires. “Who are you?” asked a nurse after the op, staggered by the donations that had come in and who they came from. “He was the guy who wrote ‘Move It’; that’s who he was,” writes Pete. I can’t recommend this book highly enough but in closing must declare an interest. The Restless Generation was published by Rogan House, Johnny Rogan’s custom imprint, and distributed through Omnibus. 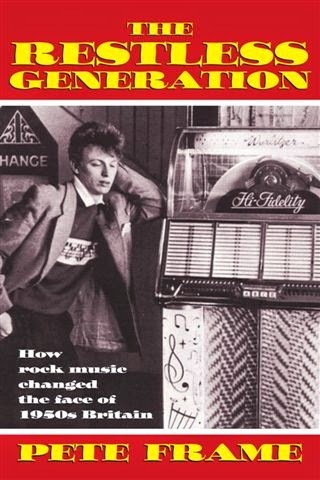 Literally just downloaded this to my Kindle as soon as I saw the picture of Tommy Steele leaning on a jukebox. Didn’t even pause to read the post. Contrary to popular belief, there are loads of really great British rock’n’roll records: “Sound of Fury”, “Shakin’ all Over” (as you point out), Joe Meek, etc. Certainly the Brits didn’t have the mystique or musical innovation of the American greats (how could they? ), but whereas Elvis, Cochran, Vincent were basically good ol’ Republican American boys, the British teds were positively outrageous, with sleep-in managers who were if anything even worse. Vince Taylor actually danced better than Elvis. And the roots of heavy metal rock sprang less from the rockabilly & subsequent surf guitarists of the USA, than the session men in the likes of Joe Meek’s studio and the Caverns of Liverpool. When I was 9 I discovered the delights of the family record collection. All 78rpms, and mostly Jimmy Shand. (Don’t ask). I have no idea how it got there, but the collection included Tommy Steele’s “Hey You” (flip side to “Plant a Kiss”). At that age (1959), and living in the countryside, I’d still never had access to the likes of Heartbreak Hotel. But my reaction to that B-side was the same as I’ve heard countless others say about hearing Elvis. Lonnie Donegan’s “Gamblin’ Man” was even better. Totally wild. I shall end there before launching into my oft told diatribe about being trapped behind a stage door in Yarmouth with Adam Faith. Thanks for bringing this book to my attention. Don’t know how I missed it!